Brandy is what happens when you further distill wine, creating a stronger, more concentrated spirit. It’s typically enjoyed solo, preferably sipped by a fire while wearing a velour smoking jacket (though that exact scenario may be personal preference…), but it’s also delicious in mixed drinks and as an ingredient in everything from rich French sauces to flambeed pear desserts. Though it’s most often made from grapes, there’s also apple brandy, fruit brandy, and tons of other possibilities. Taste the rainbow and see what perks up your palate. In the meantime, here’s more information about this seemingly bougie drink and how you can work it into your everyday cocktail repertoire. Did You Know? The most expensive bottle of brandy is the Henri IV Dudognon Heritage Cognac Grande Champagne. It costs about $2 million and comes in a bottle studded with 6,500 diamonds and dipped in 24-karat gold. So, classy. Brandy is one of life’s tastiest accidents. Wine is one of our earliest alcoholic beverages, but as popular as wine was for trading, it was terrible for shipping and the hefty weight of full barrels added up to a lot of extra taxes. It took up a lot of space and it didn’t always hold well. In an effort to pack more cargo into limited spaces, a Dutch trader dreamt up a way to remove the water from wine, intending to rebalance the barrels when he reached his destination. The name “brandy” comes from brandewijn, a Dutch word that means “burntwine” and references the original quick, heat-driven concentration process. As it turned out, that secondary distillation not only concentrated the wine’s flavors, it also brought out new flavors and aromas; instead of a thicker, more wine-y wine, the result was a different beast altogether. Brandy grew popular as a drink in its own right, and technological innovations and improvements in production technique followed. Top producers are now extremely selective as to which grape they use. In Cognac, the only grapes allowed are white grapes from one of six approved terroirs. Blending is an art form, and often done by committee to ensure the utmost quality and balance. These days, Brand is made and consumed all over the world. The French market is huge, but there are also producers in Chile, Mexico, Spain, South Africa, Greece, Italy, and beyond. 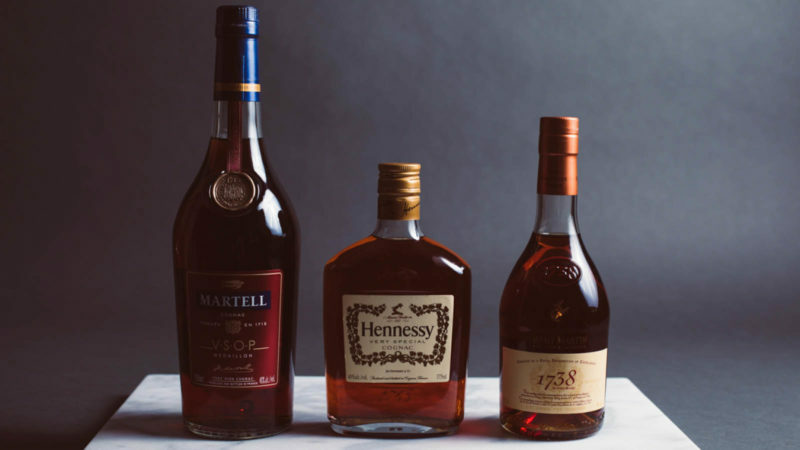 It’s easiest to view brand as one huge category with four subcategories: Cognac, Armagnac, American brandies, and flavored (typically fruit) brandies. The terms Cognac and Armagnac can only be used to describe brandy made in those regions in France while brandy can come from absolutely anywhere. Other regions have their own special brandies, too; Chile and Peru have a grape-specific brandy they call pisco while Spain has brandy de Jerez. There are also non-grape brandies. Calvados, one of the most popular examples, is made from apples. Hungary’s plum brandy is legendary, and Slovenia has a brandy made from fermented juniper berries. Manhattan, martini, Cosmopolitan…. Metropolitan? This would-be classic (it first appeared, in a version slightly altered from the one here, in the 1935-edition of The Old Waldorf-Astoria Bar Book) is delicious and sophisticated, and shows off the complex qualities of brandy perfectly. Add all ingredients to a cocktail shaker filled with ice, mix, then strain into a chilled martini glass. Possibly the simplest cocktail you’ll ever make in terms of effort and ingredients, but there’s no shortage of flavor. The brandy is rich, dry, and a bit tannic; the Benedictine is rife with citrus and herbal notes. The combination is divine. Pour both liquors in a snifter glass and enjoy. For an extra touch, warm the snifter first – the subtle heat brings out the more aromatic qualities of the cocktail without ratcheting up the burn factor. A good way to clear out the liquor cabinet and impress your guests. The Vieux Carre is a New Orleans invention, and it accordingly feels like a party in a glass. Festive, tasty, and not for the unadventurous. Combine all ingredients in a shaker filled with ice. Stir to chill, then strain into a chilled cocktail glass. Garnish with lemon twist.